Elise Wiggins, executive chef of the popular Italian eatery, Panzano, (in Denver, Colorado) has a Southerner’s love of good food and big flavors, born of her Louisiana roots and honed in culinary stints around the globe. 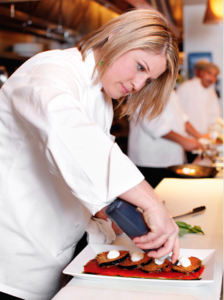 Recently chosen to prepare dinner at the famed James Beard Foundation House in New York, her sous vide Lamb Croquette recipe got her rave reviews from their culinary illuminati! We were lucky enough to catch up with her recently and she was generous enough to share some of her sous vide insights with us. SVS: You began your culinary career in Denver and have now come back to the Mile High City. Where have you been in the interim and what did you learn in those locations? EW: I spent a year in Central and South America studying the cuisine after that Puerto Rico and then to Memphis, Tenn.
EW: Because a very young age I saw my mom give the family fresh baked cookies and noticed the big smiles and happiness that came over us as we ate them. Right then and there I equated that if you make good food you make a lot of people happy. I wanted to make a lot of people happy. SVS: Do you follow a particular style and influences in cooking or do you prefer to experiment with new flavors, ingredients etc? EW: I follow any cuisine that has deep and haunting flavors. SVS: When did you first encounter the sous vide technique? EW: Wow…long time ago. I think ten or more years ago. SVS: You’ve cooked at the James Beard Foundation House. What was your most memorable experience there? EW: Having to cook so many courses out of such a small kitchen. SVS: What are your favorite recipes that you cook in the SousVide Supreme water oven? EW: Love to cook lobster. It’s such a delicate item [and easy] to over cook. Sous vide cooks it perfectly every time. SVS: If you were a novice cook and wanted to cook a sous vide dish, what would be your go-to, never-fail dish? EW: It [offers more] precise control over just sticking a wand in a cambro of water. SVS: Do you use your SousVide Supreme water oven for entertaining at home? EW: Yes, again when I do lobster or seafood that I want spot on and I need to be able to do other things in the kitchen. When you cook at home, you don’t have a brigade of staff to help you. Sous Vide gives you that extra hand in your own kitchen. EW: Again, it can be that extra set of hands that you may need in the kitchen while you prepare something else. You set it and go on to another project. You can’t do that when you grill or saute things. SVS: Do you feel that sous vide cooking is here to stay – what are your thoughts on future flavors, ingredients, and cooking styles? EW: Absolutely, it’s state of the art. If people would just try it, they’ll fall in love because it’s so easy. SVS: What are your plans for the future? OK, now we are definitely intrigued and can’t wait to find out about it! Please give us all a heads up when it’s ready to open!